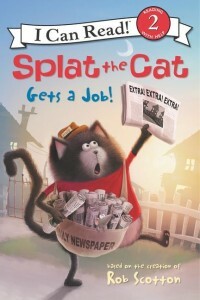 You know Splat the Cat from his bestselling picture books and phonics fun in Level One readers. Now get ready to graduate with Splat into Level Two readers! This all-new I Can Read features splat-tastic inventions as Splat tries his paw at a new job—newspaper cat. Splat is so excited to be the new newspaper cat! But getting up super early, keeping track of all those papers, and delivering to all those houses sure isn’t as easy as it looks. With help from Kitten, and some cool inventions, can Splat figure out how to toss papers like a pro?